We all get jaded by our daily environment now and then. Even when your windows look out on the ever changing water, a side trip can make a big difference. Lately I’ve tried to tear myself away periodically and get out to other waterfronts. 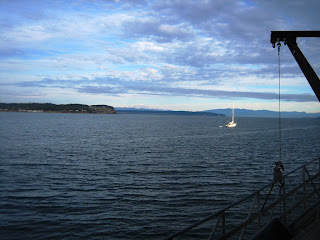 Whidbey is a long narrow island. Driving its length you see the water first from one side then the other. In a few spots you can see water on both sides at the same time. This means that ten miles north or south from home the surroundings are completely different. 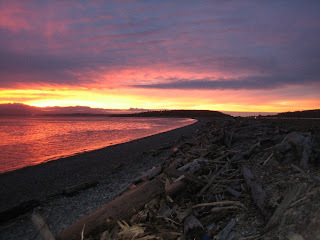 When I heard that literary agent Andrea Hurst had organized a weekly writing session at the Coupeville Pier it sounded like a good excuse for a quick trip. I brought my laptop and joined a few other writers to just write for two hours. A little dose of sit-down-and-get-it-done. I’ve written in numerous waterside spots over the years. It’s what I do. Beaches, boats, parking lots and ferries, have all been writing venues for me. 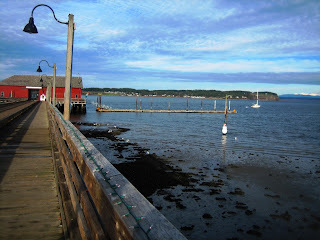 But the Coupeville Pier was one place I’d never sat long enough to put down words. Though I’ve been out to the pier a hundred times, I’d not yet been to the coffee house at the very end, The Salty Mug. 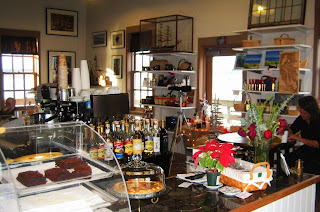 I’ve written in every other coffee house on Whidbey Island, this one would be no exception. I arrived expecting great things, not least of all was a fantastic view of Penn Cove, and a jolt of inspiration for the piece I was working on. 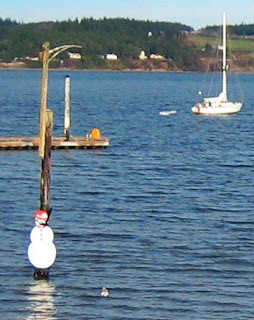 The weather cooperated, the water was calm and blue and a snowman wearing a mask and snorkel met me half way down the pier. Auspicious. The coffee house is surrounded on three sides by water. 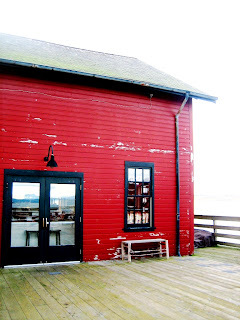 The back door opens onto the pier’s picnic deck, a great place for a summer picnic, and even at 40 degrees the bright red tables looked inviting. If this writing on the pier thing works out I can envision myself here this summer working on draft after draft. The cafe was warm and bright, the writers friendly, the mocha foamy and fragrant. After an introductory chat we all fell to writing, surrounded by the scent of coffee and views of the sea. Just up the street from the pier is my favorite food shop, Bayleaf. What better way to round off a mid-winter vacation than with a nice artisan cheese? I stopped in to splurge on a small chunk of blue. They always have a selection of three or four unusual varieties, and they give samples. No little plastic spoons though, just a sliver of creamy goodness on a little piece of waxed paper. This time I settled on Valdeon a dry, strong blue. Then the Pecorino Tartufo caught my eye. It wasn’t blue, but oh my what flavor. As I drove back south, I looked out over the fields of Ebey’s Prairie and noted that those snow capped Olympic mountains were looking pretty spectacular. At the next intersection I swung the car to the right and headed down to Keystone to watch the sun set. 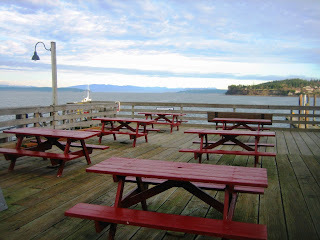 Red picnic tables, blue cheese and a rose, orange and indigo beach. Not bad for a mid-winter day in the “gray” Northwest. Next Post:What’s Beneath the Salish Sea?